Hi all! Here's my entry for Deadcember 2016: The Quick and the Dead. As mentioned in a previous post, a lot of people have interpreted the additional theme this year to refer to something fast, yet still undead, bringing promise of Zombie Dragons and Undead Cavalry and chariots etc. Brilliant! That's not the way I've gone however, as the phrase "The Quick and the Dead" always says Wild West gun slinging to me, and that fit in beautifully with a sub project for my ongoing Rogue Quest project, so I grabbed my chance to spend some time on some minis I've really been looking forward to working on. ...and shambling back off again, to do their master's bidding no doubt. What? You don't think undead soldiers from worlds with primitive tech go around raising themselves do you? 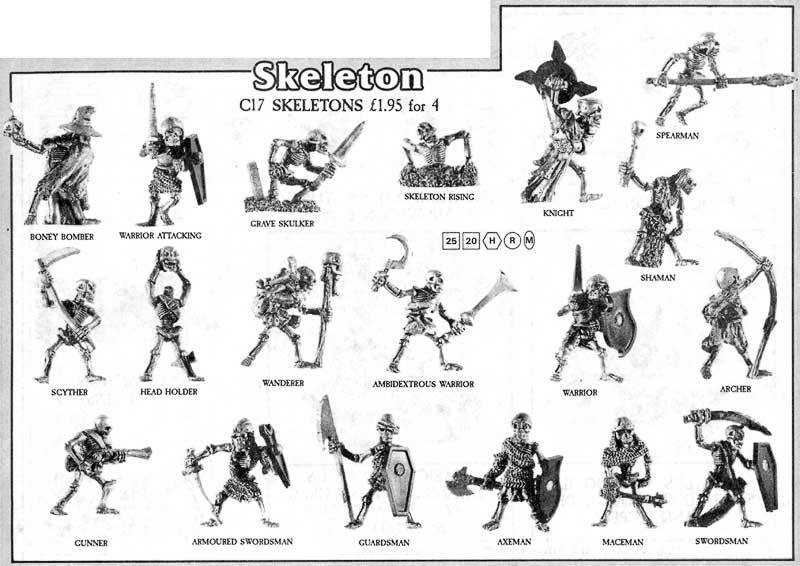 They are of course two classic Citadel C17 Skeletons from the March and July 1987 Flyers - the puntastic 'Rambones', and the slightly less imaginative 'Gunner'. As suggested by the sculpts themselves, I've based the colour schemes on Vietnam War and English Civil War era equipment. 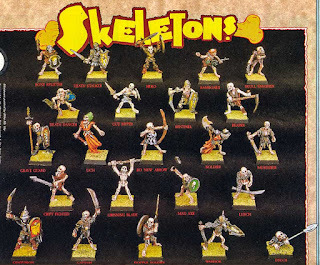 The bone colour on the skeletons was done in exactly the same way as for my Deadcember 2015 fantasy skeletons, except I left out the additional green ink in the last wash, as these boys have been raised from the same dry brown dirt of their bases (to fit in with the other Sci-Fi models they'll be used with). As usual, I used a mix of Citadel and Valejo paints and inks. A couple of things to mention here I suppose, firstly I used the new(ish) Citadel Dry 'Golden Griffon' to add highlights to the brass shell casings on the two Rambones. I've used it a couple of times before and I do like the effect it gives as a highlight to darker gold base colours, but I find the powdery nature of the paint can be a little imprecise. This is almost certainly down to user error, and I found it worked a little better this time so perhaps practice is the key. A final wash with green ink toned it back down but picked out the individual casings nicely. Also on display, the scenery my lovely wife made for me for Christmas from a pdf scan on to card stock. Thanks love! Secondly, on the Civil War era Roundskulls (sorry/not sorry), I used Valejo Model Color Verdigris Glaze. This doesn't show up well in the photos, but I'm really happy I went with this (it felt like a bit of a risk at the time as I was pretty happy with the finish at that point) as it has both toned down the shine of the metal (I used bolt gun metal over black, but even so...) and added some interest as you rotate the model to look at it. This warrants further experimentation! I do love these minis. Now I want a horde of them! I do slightly regret painting both sets identically, although this does keep with the theme that they are animated corps's (pun intended) of line troops in uniform, which is what I wanted, they don't have a huge impact as identical pairs. However without major remodelling there was not much to be done about them being identical. I did add plastic grenades from a 3rd edition era Cadian/Catachan bitz bag to both of the Rambones, as the raised arm was crying out for it, and it made no sense to have them both as Skeleton NCOs giving commands by hand signal - that wouldn't fit with how I see them being used anyway - but this just emphasises there sameness in the end. The only slight variation comes from the fact that one of the Roundskulls is a recast. This became glaringly obvious once I had two next to each other, as both the weight and softness of sculpt were off, combined with the fact the very odd angle of his base tab and feet meant he needed some additional basing material to make him stand at a reasonable angle. Looking at the scale of all four models I'm thinking one of the Rambones might be a recast too, which would make sense as I bought them as a set of two from the same seller on ebay. However, it is not a bad job and other than the additional stone on the base you can't really tell much difference now they are painted up. The two suspected recasts are far left and far right, which are just a tad larger all over than the other two..
Now, I'm definitely expecting to come in the lower percentile of entries, not least as the standard is obviously going to be very high given the quality of work among the Oldhammer Community, but that is not the point. This is a pretty big deal for me as it is the first time I've ever been happy enough with my efforts to even consider entering a painting competition, friendly, online, or otherwise. I've thought about my entry and it's Oldhammer credentials (not that such things should ever be a primary concern), tied it into an ongoing project, and produced paint jobs I'm happy with, so I'm dead (groan) chuffed with myself. Thanks for stopping by this cold bleak Deadcember 2016. I hope you come back in the new year when you will hopefully be able to see these gun toting bags of bones in action in a future instalment of Rogue Quest. Well hello.. won't you come on in, take a load off, and meet A'Rhea LI, Xenos Psionic Thief and the fourth instalment of my take on the Rogue Quest project. So, A'Rhea LI, whats her story? In terms of her role within the party, I've found myself tending towards the same preference I have in online RPGs and am choosing Characters/Classes all of whom have some 'spell casting' type ability in D&D terms, even if this only kicks in at later level in some cases. As a DM and a player I'm a big fan of the potential that a combination of Rogue and Spell Caster presents. The classic example of this is the Illusionist/Thief in D&D and I see A'Rhea LI in that vein. The other great thing about Rogues is all the skill points, so A'Rhea LI has some decent tech savvy to boot. The small 'communicator device' on her wrist boasts some custom electromagnetronics to help her gain entry where others would keep her out. The hand in the pouch is really evocative of the Thief class, reminding me of the old AD&D 2 rule that Rogues had to try and keep one hand free as much as possible, preventing them from using most two handed weapons, but allowing them to pilfer items at random! The paint job is not my finest, and these photos don't show up the contrast between the light blue-grey (which ties her shoulder and knee pads in with the webbing worn by some of the other party members) and/or the dark blue of her jacket and the green of her skin, so she looks a bit drab here. I'm annoyed with myself for taking the skin shade too dark. I should have thinned down the last wash of green ink and I've lost a lot of the classic 'Grey' Xenos look she had earlier in the process. It was a learning experience however. Limitations aside, she does tie in really well with the rest of the group whilst still having her own identity by making much bolder use of the red spot colour. I deliberately voided any purple this time, as I don't want that to become too much of a theme colour for the Xenos elements within the unit. Her equipment was painted up in standard issue cammo green and brown leather to suggest that it has been picked up in a PDF Surplus store somewhere. The mini is from CP models Sci-Fi 'Hired Guns' range. They are supplied with alternate Human and Xenos heads (which reminds me, I must find where I put the human female head I didn't use... that sounds really bad when you read it back to yourself). I loved the classic look of the Xenos head, but wanted to bring her more into the Rogue Trader universe, so upgraded her pistol to an over sized Laspistol from an early GW weapons sprue. The original pistol was carefully removed and has already found it's way on to another model that needed a bit of TLC. The hand in the pouch is a brilliant touch and what absolutely sold me on this sculpt. For me it is an important tie in to the classic D&D/Warhammer Quest Thief class she is portraying, but would serve to emphasise her more 'special ops' role in any force. I also really appreciate the femininity of the sculpt which has been achieved without losing a sense of functionality about the equipment. I played this up by giving her a little red dress in the Unit spot colour. With the role that I see her playing as both an infiltrator and a spy, the bright red might at first seem incongruous, but I want her to be a bit of a femme fatale, with a hint of Gangster's moll about her past, so she gets to keep her red cocktail dress and uses her psionic abilities to make up for any loss of camouflage. "Don't mind me boys, just passing through on my way to steal all your stuffs!" "My name is A'Rhea LI... please... I..." the words appeared in his mind as his harsh demand had appeared in hers. "WHY DO YOU STEAL FROM US!?" The words came like a psychic assault, battering through her well practised defences, painfully extracting the truth forcing her mind voice to say the words. "I... I need to raise funds to get off world. Fast. Last job went bad. They're on to me..." She fought to keep from blacking out under the strain. "How did you get through the perimeter without triggering the lasers? The words were not as painful this time, though the voice still held a tone of command that A'Rhea could not resist. "My bracelet, some security counter measures of my own design, and a simple planting of a noise in the Eldar's brain, exploiting the fact he had sensed something amiss to send him off in the wrong direction..." Her mind voice was cut off. She could feel the other mind probing deeper. Even her breathing seemed like it was being controlled. She'd never felt psychic power like this before and didn't care to again. "Impressive. Most impressive. You say you need to get off world. What if I gave you that opportunity, and an offer of employment to boot?" "I... I'd say I was interested, but..."
"Very well. If you can rejoin me here in 3 hours time, you shall have you passage off this world and gainful employment that will suit your specialist talents. Although, you should bear in mind that we will of course be improving security with immediate effect. It appears we've had an unfortunate breach you see..."
2.68 standard Terran hours later A'Rhea LI stood at a porthole watching the rapidly disappearing speck that was Nate's Point as the Unit made it's way off planet and on to the next job. Sven is left scratching his beard after the laser fence posts are disabled again, even after he remodulated the control algorithms from the default factory setting! I'm really chuffed with the laser fence posts/sc-fi objective markers. I wonder if anyone recognises what they are? The release of the latest film in a certain franchise might give you a clue. That's right! They are made out of the front end of Corellian Corvette Blockade Runners out of StarWars Kinder Surprise eggs stolen from recovered after being discarded by my children. I've rescued a few potentially useful bits from the ships that came with these weird over sized plastic heads sticking out of the top of them. Luckily both C3-PO and Princess Leia giant heads came with Corvettes, so I have plenty of them, but it was actually the engine pieces that originally caught my attention - they look like multi-launchers for vehicles, or maybe sentry guns? More on them another time possibly. The Kinder-Corvettes have annoying wholes where the giant heads connect the two halves, so they got a slap of milliput to fill them in, which then also got flocked to make it seem like the posts are a bit more embedded in the ground. Anyway, they got such a simple treatment with the paints that it's not worth repeating in detail, because there is no detail, but they do the job admirably I think. It's precisely because of how simple they were to make that I like them. The MDF bases are actually 27mm off cuts from Dave the Scenery Savant, no good for basing models (or objectives for that matter) for gaming purists, but handy enough for this. I kept thinking about the sonic towers from Lost whilst I was making them. I wonder if Sven the Squat Tech-Bard might be able to hook these babies up with sonic emitters and program them with the Brown Note? I also like them because I definitely wouldn't have got round to making them so quickly after having the idea if I hadn't been doing the Rogue Quest project, so it's another case of being spurred to more productivity by Oldhammer projects and blogging. The next level of Rogue Quest has also spurred a spin off project! A villain no less, not the Big Bad, you understand, but definitely a... Bad? But that will all have to wait for the New Year (well sort of) as I'm going to be working on finishing off my entry for Deadcember 2016: The Quick and the Dead between now and the end of the year. That and the drinking. Let's not forget the drinking. So I've been having my own private painting theme for November 2016. When I got back into the Hobby last year, and then really got into the Oldhammer Community over the summer of 2015, Erny's idea for Orctober really caught my attention and imagination. Sadly I couldn't quite my brushes lined up for Vermember (which I think sort of sprung up as slightly tongue in cheek reaction to Orctober, but I'm not 100% about that) as I had too many other projects on the go, even though I had some of the old Fantasy Regiments white plactic crack Skaven undercoated. I did manage to get myself sorted for Deadcember 2015 and had an absolute blast bringing these guys back from the dead. So I kept hold of my undercoated Skaven with a mind to this year and some cozy, uninterupted autumn evenings being warmed by lukewarm cups of tea and the glow of the daylight bulb in the painting lamp. Ha! Haha. Hahahahahahahahahhaaaaaaaaa!!!!! *sobs* *sniffs* Yeah that didn't happen. Also over time I'd aquired this already painted Skaven Jezzail team. I quite like the pale flesh and bright red-orange claws, and the green and purple colour scheme on the clothes matches the colour scheme I use for my broad alliance of Warhammer Fantasy bad guys, which I was also planning to use on the 3rd edition Skaven themselves. So I decided that these would be my rough guide to what I wanted to end up with. I've forgotten when I got these, and I don' think I had a plan for them other than I've always liked the model and it would have been a bargain on ebay. It has been hanging around a bit unloved tbh, so it needed a few touch ups where it had got bashed. Not sure I have achieved that, as I've only brought them up to my usual 'table top ready' standard, which will fit in with the the rest of my WFB horde, but they sit alongside each other reasonably well in the end so I'm happy enough. Back to bright green painted bases, but they fit the rest of my WFB forces, and at least I fill in the gaps with putty these days. I used a similar colour palette to both the Jezzail team, and my rag tag WFB mercs, painting their clothes in the appropriately verminous colours of scab red, worm purple, hideous blue, and err... forest green. I used London Grey from Valejo for the leather armour, strapping and wrist bands, as I like the slight shine it has which gives it a heavy quality on fabric, leather etc, but then inked that down quite heavily to give the armour both grime and some definition. I freehanded the red skaven symbols and decided to call it a day pretty much. One thing I'm not massively happy with is the eyes. I debated whether to go for the classic opaque red glow, or whether to leave them unpainted, as the inking had left them with a shadowy sinsiter look. In the end I opted to try and tie them in with the lycanthrope vibe by using the same style of eyes as I had on a recent werewolf. As these guys are potentially going to act as wererats in my D&D campaign I liked the idea of lycanthropes having the same mad staring eyes. Unfortunately the sickly yellow eyeball with a red pupil, while making them look manic, has also made them look a bit cartoonish and in the end detracted from the overall finish. I painted the rest of the giant rats with red eyes if the eye ball was prominent, or left them shadowy if not and I'm happier with those. I really should have left the eyes shadowy from the inks, but unpainted, for a more naturalistic look. I like the bright red claws though, even though they are just as cartoonish. I enjoyed painting the tails, highlighting up from Tanned Flesh to Dwarf Flesh. The pouch is Billious Brown with Flesh Wash. Blades are Bolt Gun Metal with Armour Wash. The random giant and were rats have been based up for use in D&D etc. so I've gone for a simple basing treatment that will keep them usable for D&D, HeroQuest, Frostgrave etc. They really are a mixed bunch and one in particular was a very ropey specimen indeed. One of them I've really come to love however. I quite like the diversity of wererat forms this provides me for my D&D campaign, where they were an early feature that I hope we return to. I'd focussed primarily on the unit of 3rd Ed Plastic Skaven and time for my Vermember project was running out, so the giant rats and the smaller of the two ratmen all got the same treatment of Bestial Brown up to Snakebite Leather for teh fur, and Tanned Flesh up to Dwarf Flesh for the feet and tails, and then a thinned down Armour Wash over the whole lot. I then went for the same bright red claws which I liked so much on the skaven, also as a bit of a tie in even though the basing is completely different. As previously mentioned, I left the eyes shaded, or picked them out in red depending on the sculpt. Could have done more with these, but ran out of steam and needed to move on. Pretty sure this is a GW Giant Rat from a WFB swarm. The white metal alloy suggests Middlehammer period, but my Skaven knowledge is poor. I picked these up in a job lot on the Oldhammer Trading Post, and one of them was a really ropey, dare I say amateurish sculpt. It's an oversized and impractical beast, the tail overhanging even a 25mm base, and his feet/claws look like there is a twist in the leg at the ankle. As I painted him he came to remind me of one of these little blighters, which did little to endear him to me. However, on the day I came to finish him I ended up watching the Princess Bride with Son#1 at ridiculous o'clock in the moring whilst his Mother valiantly tried to get Son#2 back to sleep, and I saw the fight with the amateurish, mishapen, giant vole rats, and suddenly all was forgiven. I sort of like him now he's done. He can do service as a Dire Rat thanks to his size. Does anyone have any clue as to the manufacturer? Not the best photo to show it off, but this chap is interesting as he is holding a short sword. I really like the pathetic aesthetic this model has, which really fits the D&D wererat mythos for me. The inclusion of the sword promises the threat of a backstab from the shadows, possibly from that sewer grate you just stepped over and are now being dragged back into by dozens of sharp little claws, all you can see are red eyes gleaming in the darkness, and the stink... oh the stink! I really like this model, bags of character. I'm already coming up with a character and backstory for him. This last one was a different manufacturer again. A very thick solid base with no obvious markings on the bottom. Now that I'm thinking about it, the only models with similar bases I've had in my own possession have been the Alternative Armies Ion Knights, so maybe I'll check out the rest of their ranges. He's a big beast, and the two handed polearm said Stormvermin to me so I painted him up with a view to him being a veteran, with white patchy fur and skin showing through (pretty sure this is intended by the sculpt). The leather armour is Scab Red up to Blood Red with two coats of Armour Wash for a laquered leather look. The metal, pouch and claws all got the same treatment as outlined at various points above. The thing I regret on this one is having the colours of the rope and brocade around the weapon the wrong way round. Blue rope with gold brocade would look much better. The more I look at it the more it bugs me, and I don't know why I did it. There's bags of detail on this model, from the extra blade on the belt, with the same leather loops that attach the puch on the other side, and a giant rat huddled protectively under his haunches. This really deserved more time than I gave it, even though I gave it more time than the others. I did give a little extra thought (but probably not care) to the base, marking in two drainage channels filled with dubious brown run off, hopefully giving him a more sewery vibe. Anyway, the next awesome Oldhammer monthly painting challenge is now well under way -Rab's Geekly Digest brings us Deadcember 2016! Hoorah! My own take on the theme, and I think this was shared by a few other fb group members, is more gun smoke and chewing tobacco. Always keen to harness the motivating power of a monthly painting challenge, I've siezed the opportunity to work on a project within a project, that I've been planning for a while, which involves gun slinging undead. Pretty sure the one on the far left is a recast now that I have them next to each other, but its not terrible. The classic Citadel skeletons with Blunder Buss and Machine Gun are obvious choices, but I love the models. Anyway, I'd hoped to have these based up and undercoated by now at least, but I suspect this is going to be a project for the later part of the month now. I'm really looking forward to them though and hope you come back to see how they turn out.